I wanted to do a regular series on my blog, something unique that hasn't been done before. I came up with an idea to feature small shops, that are located throughout the country. So, every Friday you can stop by and check out a new shop, and at the same time meet the owner. 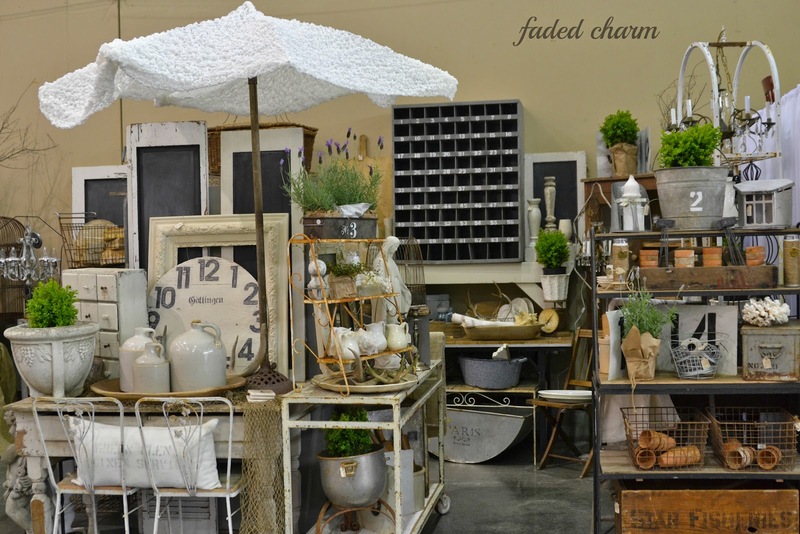 Today, we will be shopping with Kathleen at Faded Charm. If you don't already know Kathleen, then let me tell ya, you are in for a super duper treat, because this gal has it going on! 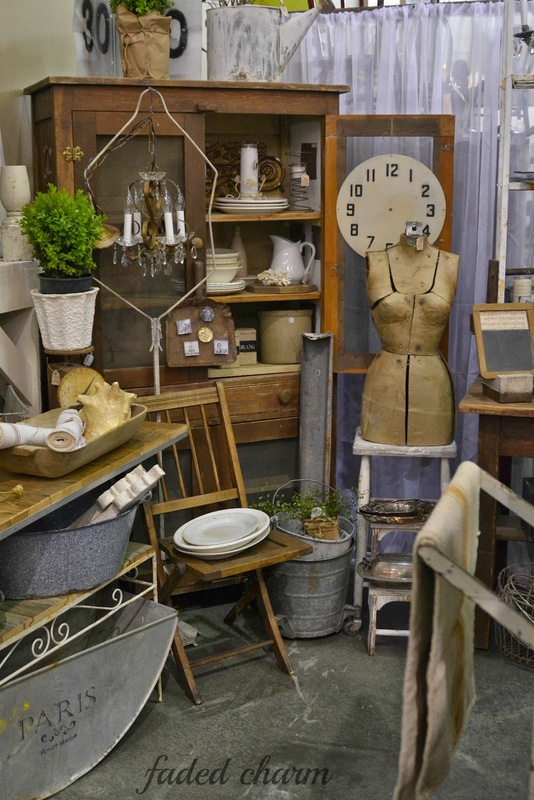 After you finish wiping all the drool off your chin, because her stunning vignettes will cause you to drool like crazy,then be sure to leave a comment and let her know that you were here at SHOP TALK. 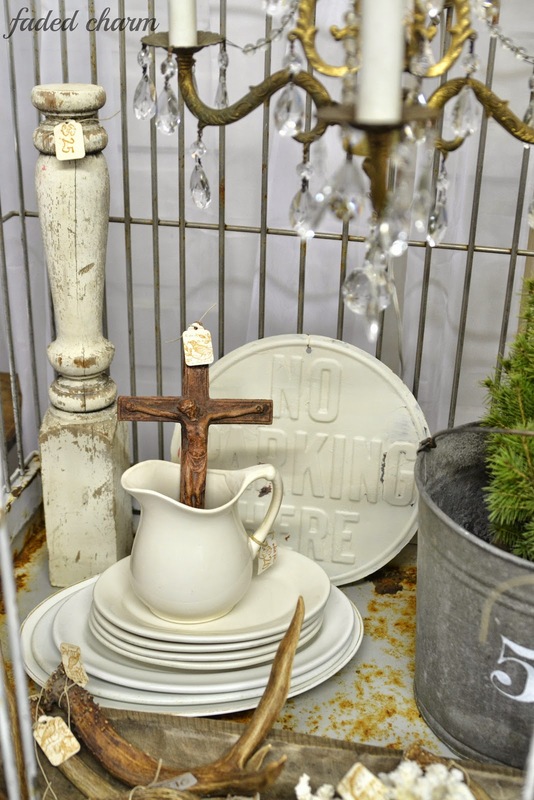 I know that you will be itching to see more of FADED CHARM, so click here for her blog and here for her facebook page. 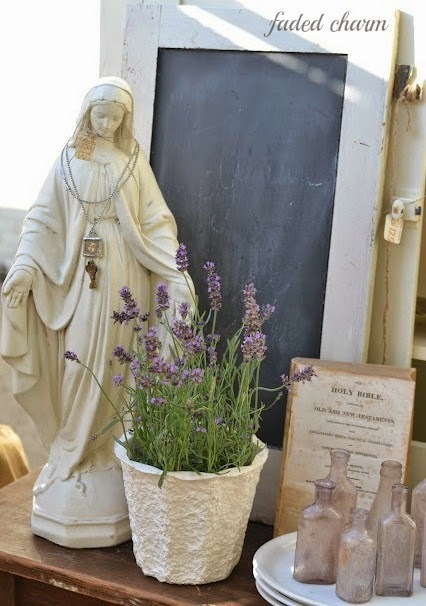 Hi, I'm Kathleen from http://fadedcharmcottage.blogspot.com/">Faded Charm and I'm pleased to be sharing over here on Linda's blog today for her new series "Shop Talk". I've been buying, repurposing and selling old stuff at Shows for over 10 years now. It has allowed me to persue my passion for junking yet I have been fortunate enough to be available for my kids all these years. I also love the fact that I can replace items in my own home when I come across something that is a better fit. 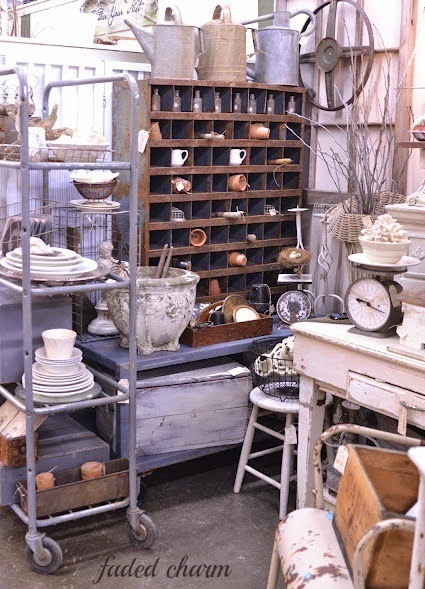 Most of my items come from Flea Markets, estate, garage or barn sales and I buy anything that has white chippy paint or a great patina. 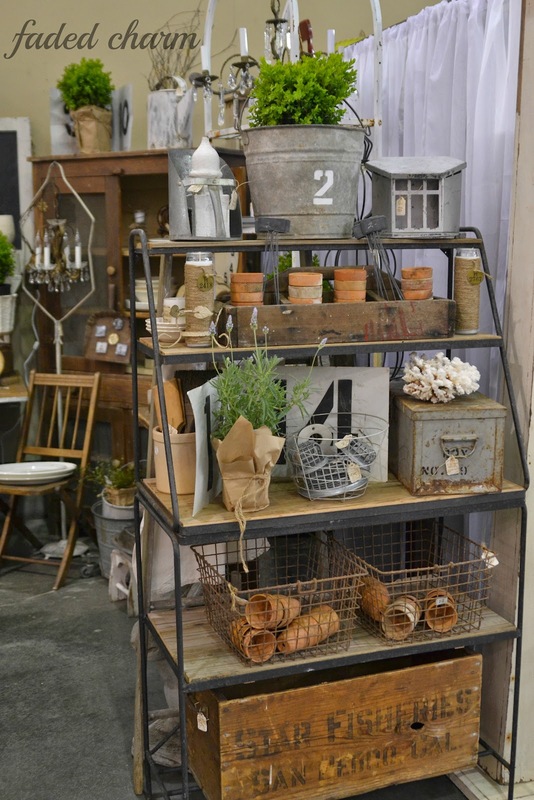 You'll also find metal and industrial, garden related items along with collections for the home. 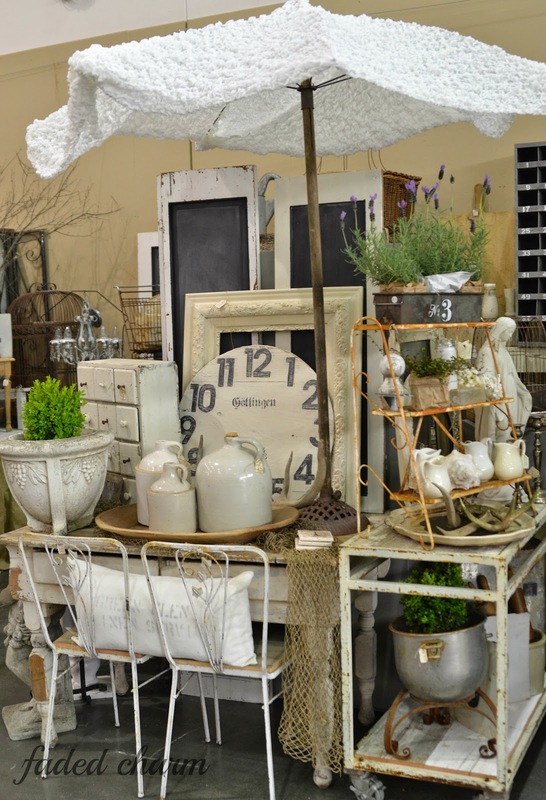 I love to think of unusual displays each Show I do and also add many items from nature. The funnest part of doing these Shows is(besides the shopping, of coarse) coming up with different displays. Last year was my first time selling at the https://www.facebook.com/thefarmchicks?fref=ts">Farm Chicks Show in Spokane, WA and it was so much fun! My sales were great, the other vendors were so friendly and all the customers were serious about shopping. Unfortunately, I won't be able to do it this year since my son is graduating High School at that time, but I hope to try it again in June of 2015. I've had a booth for the past four years at https://www.facebook.com/JunkSalvation?fref=ts">Junk Salvation in Hilsboro, OR which is close to home and I always enjoy doing Linda and Dixie's show. A couple years ago I tried having a space up in an Antique Mall and with everything in this business there are pros and cons, but I met some amazing people while there. Two of which, Amy and Kris from https://www.facebook.com/FarmandFrills?fref=ts">Farm and Frills have asked me to be apart of their Show coming up in May which I'm very excited about. My dream has always been to have my own store someday. I'm hopeful that after my kids are all grown I can dedicate the time that it takes to be a store owner, but for now doing a few Shows each year keeps me busy enough. Thanks, Linda for having me here today. Kathleen has some beautiful displays. You can tell she finds them fun to put together. She also has some great pieces just going by these pictures. I can see why she does so well! I have my eyes on that divided letter holder- cupboard-cubby - or whatever you call it. So many pretty things to see, my head is spinning! Thanks so much for asking me to be a part of this series here on your blog today, Linda. Gorgeous stuff. Reminds me of LaurieAnnas. Wish she was closer to Texas! It sure would be fun to shop Kathleen's gorgeous things in person! I've been a Faded Charm fan for a long time, and Kathleen's amazing style is reflected beautifully in her home as well. Great feature today, Linda! So many lovely things to see. Some great ways to display things. I'm enjoying this series you decided to do featuring people's booths. wow, everything is stunning. you are so talented kathleen, your dream will come true! =) thank you linda for the great feature! I love all the hidden details! 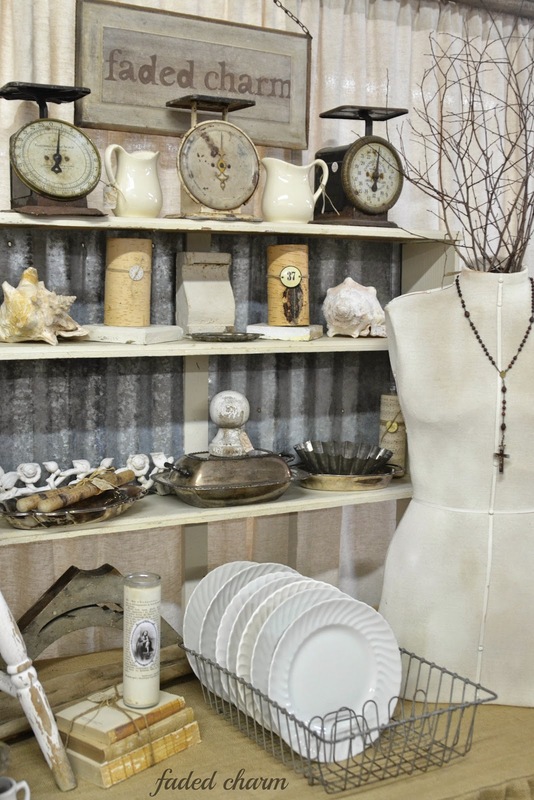 So much treasure and I love your styling! Day by day it will happen! I'm drooling! I want it all! Linda....Great series! 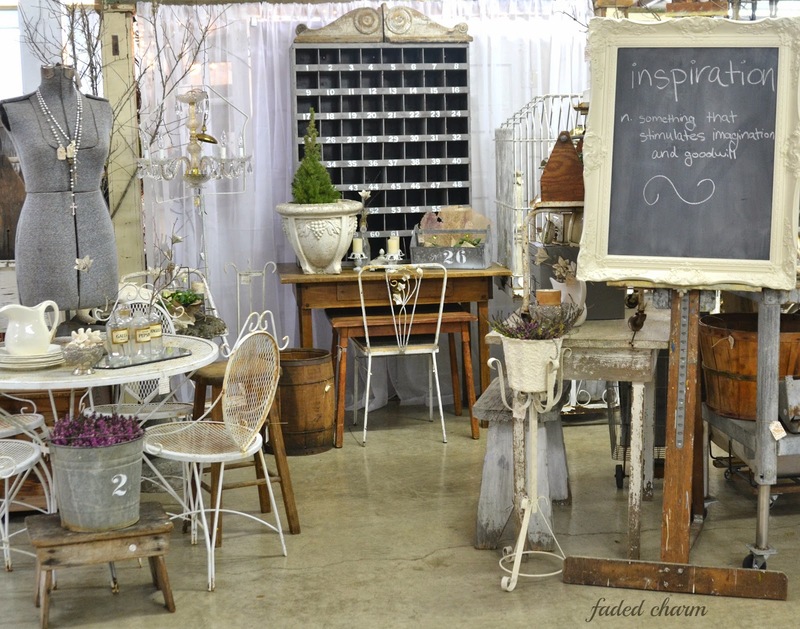 Faded Charm has an especially great style. So inspiring to view the little shop and see how she styles her accents together. I'm loving these series! So many beautiful things. 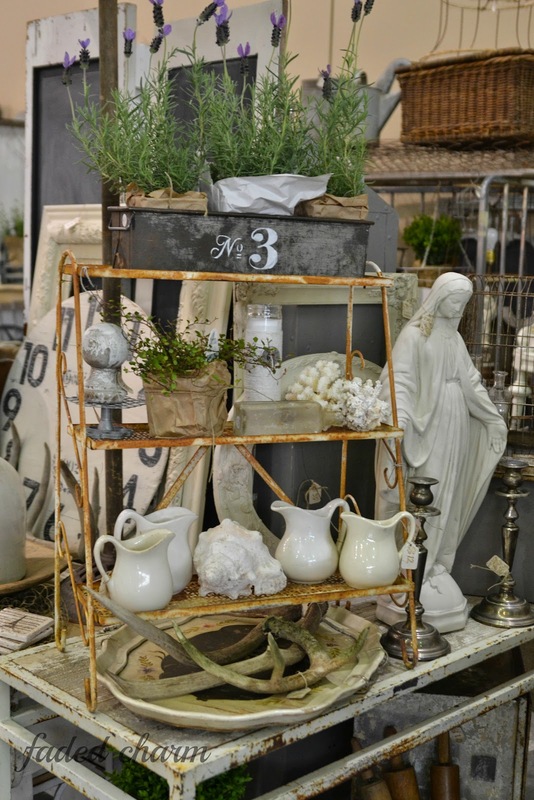 I love Kathleen's displays, those watering cans and kitchen scales got my eye! 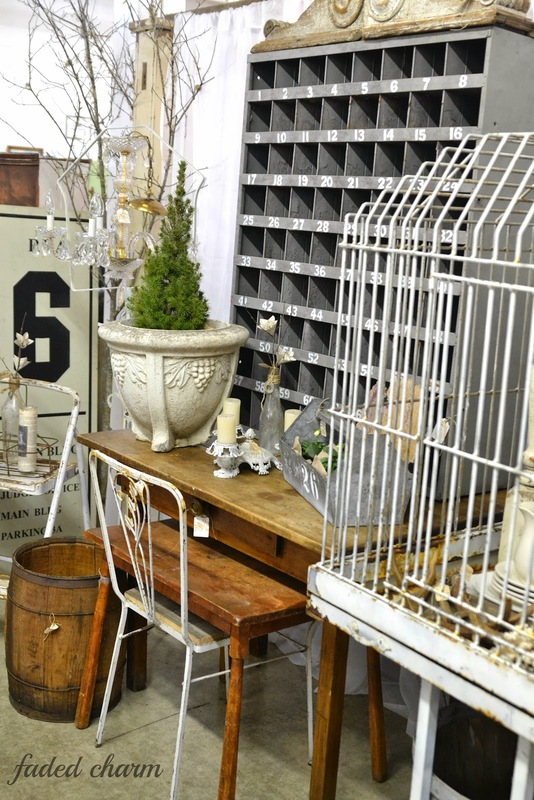 Kathleen has such a great eye for display and many wonderful items. 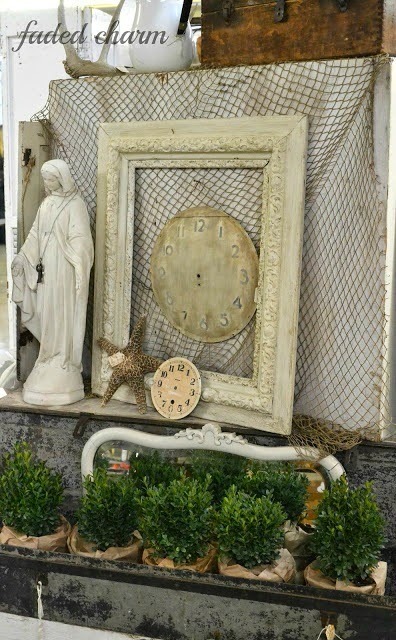 Your items are so unique and artfully displayed! Love this series celebrating the entrepreneurial spirit! 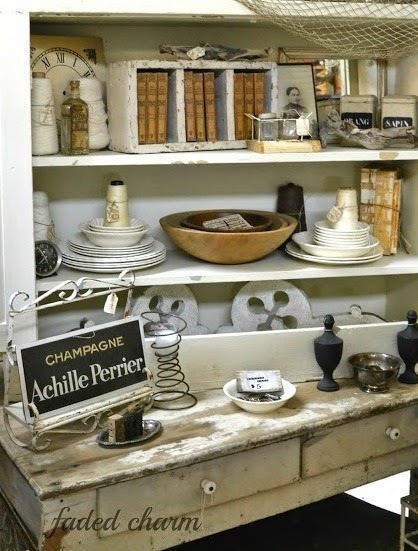 Ever since I discovered Faded Charm, I have loved Kathleen's since of style and her creative displays. Thanks for this new series. I think it will be a great hit! 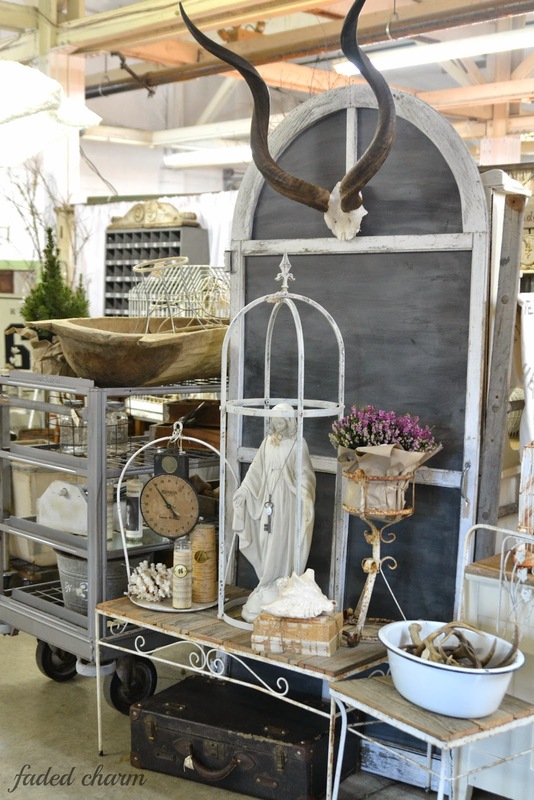 Oh I just love Kathleen's style and looking at her gorgeous displays. Wonderful series - thank you!